My research activities encompass several aspects of plant development. Above: cross-section of a Douglas fir stem. In trees, wood fulfils many functions: mechanical support, posture control, hydraulic conduction, and storage. These crucial functions demand permanent adjustments in response to changing environmental constraints. Therefore, wood formation is tightly regulated in order to react appropriately to internal and external stimuli. Each year, a new layer of wood forms during the growing season. 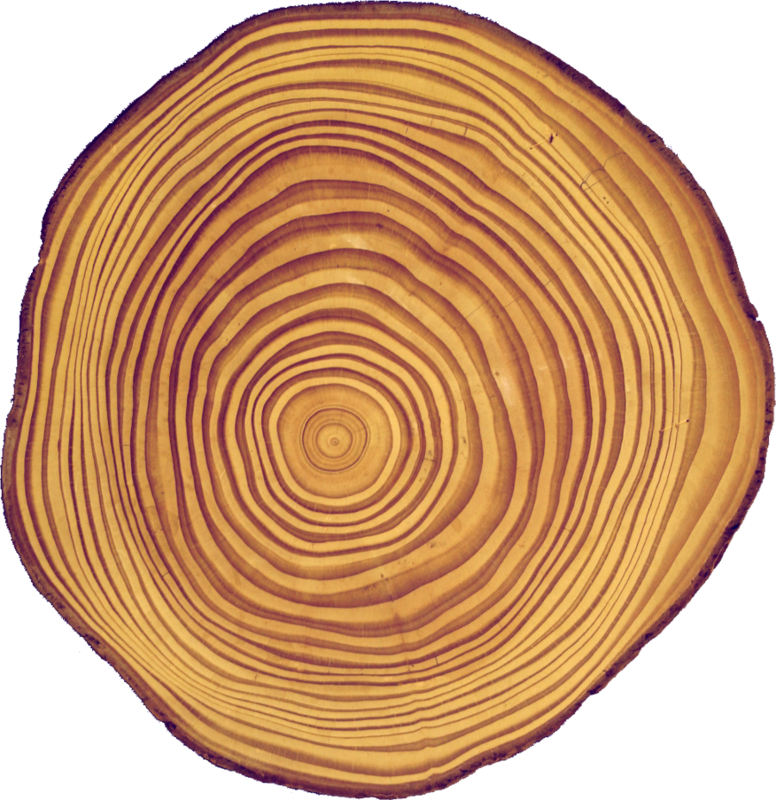 This appears as a succession of clearly visible rings on the cross-section of a stem. The ability of trees to continuously produces new wood relies on a reservoir of undifferentiated cells called the vascular cambium. 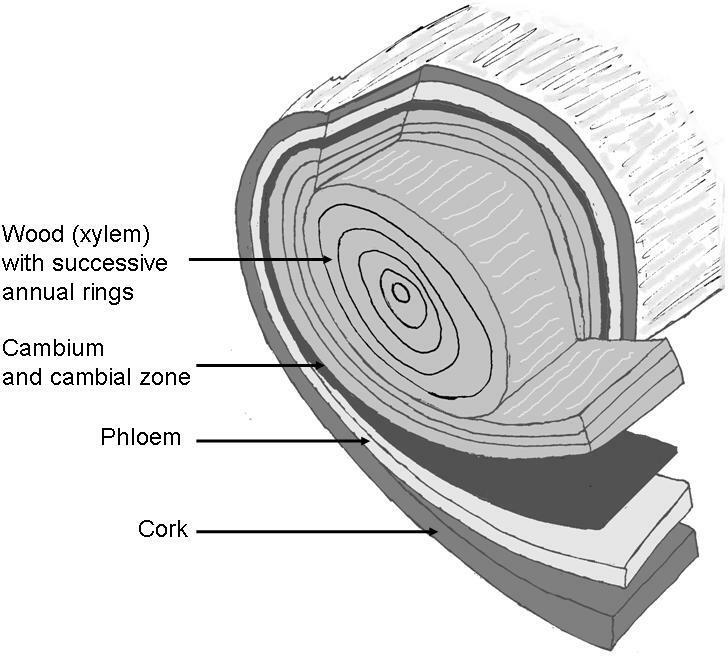 The vascular cambium generates not only wood, but also the phloem, a living tissue conducting descending sap. Above: internal structure of a tree stem (by Meriem Fournier, under CC-BY-SA). Cells exiting the cambium from its internal face progressively differentiate into wood cells. Number and dimensions of wood cells produced depend on climatic conditions and available resources. Internal regulatory mechanisms are also at work in wood formation, although they are still poorly understood. With laboratories LERFoB and PIAF, I investigate the role of plant hormones and other biochemical signals in these regulatory mechanisms. Article published in the Annals of Forest Science (PDF, HAL). Phyllotaxis refers to the regular arrangement of leaves around a shoot. This geometrical pattern has aroused the attention of natural scientists for a long time. New leaves are generated at the tip of shoots by a stem cell niche called the shoot apical meristem. The formation of a leaf starts with the apparition of a bulge at the surface of the meristem. The bulge progressively develops into a fully-grown leaf. A series of works has highlighted the prodominent role played by the plant hormone auxin in the early stages of the process. Each bulging event is preceded by a localized accumulation of auxin. As the young leaf develops, auxin get canalized towards inner tissue. A new vein forms to connect the new leaf to the vascular system of the plant, following the auxin canal. These observations support the view that auxin determines the positioning of leaves (i.e., phyllotaxis) and guides their connection to the main vasculature of the plant. Several models have been proposed for explaining how auxin converges on some spots, or how it get canalized from the new leaf to an pre-existing vessel. With researchers from the IPS in Bern, I am working on a 3D computational model integrating for the first time both aspects (convergence and canalization).